Corey called dibs on describing our 4th of July day, so I will instead write about our neighbors. Camping is a much more individualized and less certain proposition than hotels. Weather and/or neighbors can shape ones experience in a campground much easier than it would in a more solid dwelling. In 13 years of car camping, I can only think of only a few truly annoying or even possibly dangerous neighbors. And even among those few negative experiences, over time I have grown to appreciate the stories generated from those encounters. 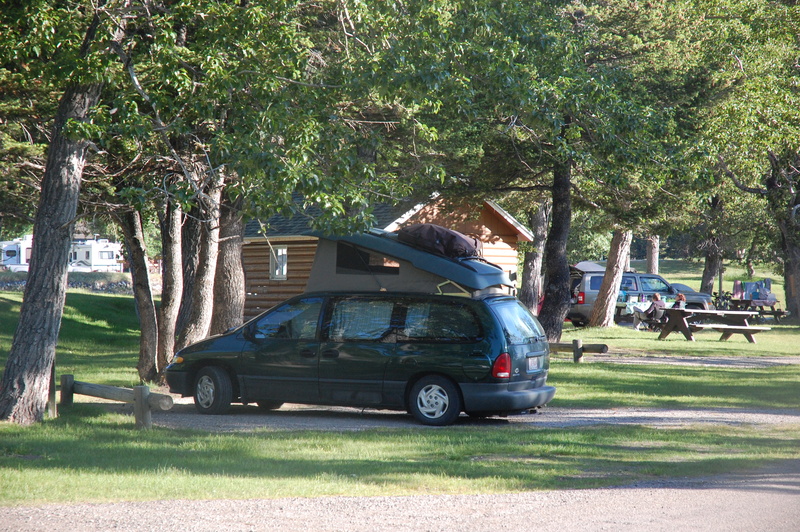 My neighbors here, at the Waterton Town Campsite, make for a wonderful neighborhood (rather than the tidy refugee camp it might look like from above). Our closest friends here are Earl, Jackie, and their son Jeffrey who is not quite two. Jeffrey has a thing for older woman and has spent a fair share of his time chasing (or being chased) by Henna. They also have a couple of games they have made up together that mostly consist of throwing grass in the air. Earl introduced himself and his family to me as we were setting up camp. Earl is a large man with tattoos over much of his body including his head which is shaved bald. I found his coolest tattoo to be the feet inked on one arm. His wife has the same feet tattooed on the alternate arm. As a retired Canadian Army soldier, Earl had many stories that he doled out only if he thought the listener was interested. Jackie, although less gregarious than Earl, also proved friendly and was equally easy to strike a conversation with. Over the several days we camped next to them we became friends and they generously shared their ginger wine and rum (both tasted well) and gave us a small Canadian flag, a Deet bracelet, several glow sticks and other little toys to Henna, and great conversations. Conversations discussed included taxes, the military, border crossings, health coverage, immunizations, parenting styles, Druidism, Judaism, Canada vs. the States, labor laws (one reason Canada’s labor force seems young to me is that in some provinces children can work as young as 12), tenting, and kayaking. I sincerely hope that they take a road trip to Chicago some time where they can stay duty free at our house. 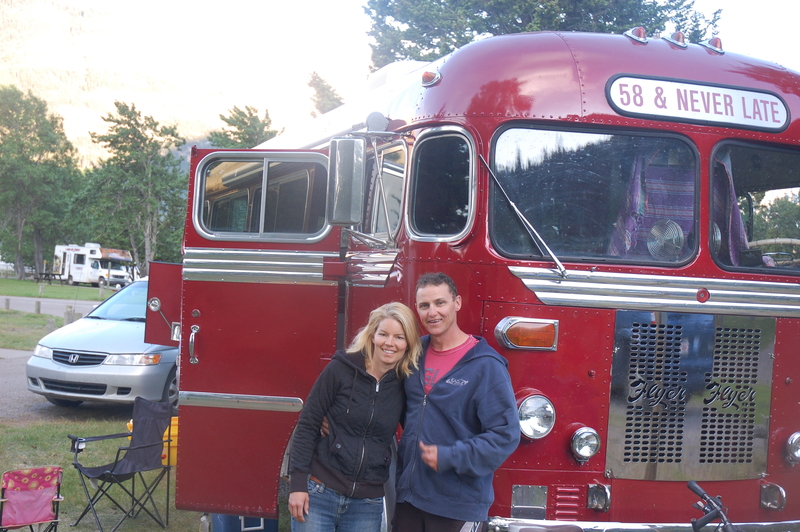 Other neighbors included friends from near Calgary who came together in a converted 1958 passenger bus as well as more traditional trailers. Henna made friends with one of their daughters (Hanna) and they introduced themselves to us as well. I should say that some places beg introductions and others breed solitude. The comfy confines and lack of fire rings at Waterton seemed to push people together in what was, thankfully, a friendly manner. Below and around us also lived hundreds of Columbian ground squirrels whose frequent hole digging, near constant squawking, and opportunistic food thieving left their mark. This entry was posted in Canadian Rockies, Ramblings and tagged Road Trip by hennacornoelidays. Bookmark the permalink.